This level has medium difficulty. 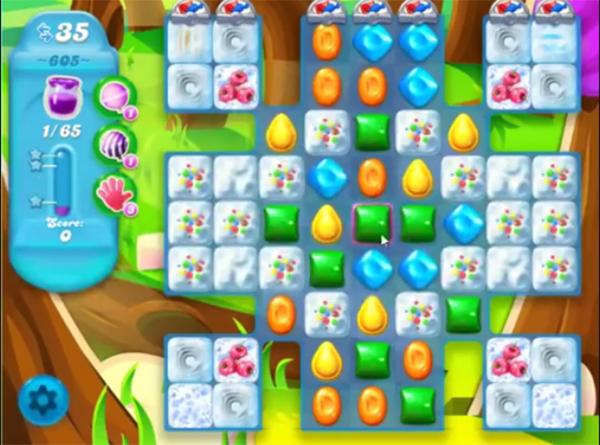 For this level try to play from the middle of the board and make special candy as you get the chance. Or play near to blockers to break them or near to jam to spread it to near candies. Combine more special candies with each other to spread the Jam to all candies within 35 moves. Why do they have to make levels so hard?? Its annoying and frustrating, can’t SC be a little more creative?? Im so sick of candies that take forever to get through, and then the licorice blockers. Almost out of moves before you even clear the center. Now I remember why I hardly ever play this anymore!!! Well, still on this level, I can’t even count the # of times I have played it. I can’t believe it really suppose to be this hard??!! I’m not sure if it’s me, my device or the app. Guess I will pretty much be done for now,,,a month of playing with no success is stupid…. Okay, seriously I have played this level over 300 times. I hate giving up, and am going to play one more board. After that I am deleting this game. This game isn’t that fun anymore, but I have persevered, but I am done. I will stick to CC. NO MORE KING GAMES!! STUCK need help on this one too many BLOCKERS to clear the candies don’t come down like you show in your video CAN you HELP me PLEASE I’m like Christina annoying about ready to uninstall too. I’ve been stuck on this level too and haven’t tried it yet but I noticed a strategy that might be the key. Watching videos, the players do not even bother trying to make special when the opportunity is there (except color bombs), they just keep breaking ice. Also, the only way to get those separate corner areas is really with fish. If fish are set off without jelly on your main board, that’s where they go, a waste of a fish and move. I’m going to try this strategy, here’s my advice. Focus on breaking ice only in your opening moves until the main board is cleared and “jellied”. Don’t waste moves yet on creating special candies except color bombs. Save your fish, as much as possible, until the only place for them to go is the four corners. And that’s when to make and use special candies. If you are at 605, don’t quit! You’ve come so far! Also, when I get really stuck, I check in every day to earn boosters and then go at the difficult level when I have an arsenal. Good luck! Good post. Good advice. I’ve tried everything I thought. But see there’s one more angle. I don’t have any boosters so I’m on my own with this one. I like the challenge but this one is not fun anymore. Boo.. There is something seriously wrong with this level, it keeps crashing out just as I’m about to finish it.